Located in the Carolina Dunes. Beautiful ocean views from the oversized balcony of this updated 3 bedroom 2 bathroom condo makes for a memorable vacation! You will feel right at home with granite countertops in its large open kitchen, luxury plank tile, flat screen TVs, full sized washer and dryer, spacious living room and a private balcony giving plenty of room for you and your guests to enjoy your Myrtle Beach vacation. Master bedroom has a king bed with a full bath, the second bedroom offers two queens, third bedroom with two twins and the living room has a sleeper sofa. Great Property Right On The Beach! We had a great stay at this beach condo! This was our first time in Myrtle Beach and thought we'd see more sunshine(so if you are looking for sunshine & warmth visiting in February is risky). Otherwise the area was great and the location of the condo was wonderful with great views of the ocean. Our only "gripe" with the condo itself was that the shower in the master bath had next to no water pressure and we only had hot water if you grabbed the first shower in the morning. The other bathroom had lots of hot water and great water pressure. Overall we had a wonderful week. Decided to do destination SC for fall break for our family trip. We had s total of 4 kids and 2 adults. We arrived and we're able to go right up to the condo and unpack. The condo was more accommodating each kid had their own bed, we had 2 bathrooms so it made getting cleaned up eaiser and shorter period of time vs one bathroom. We never felt cramped plenty of closet space/storage and room. A family of 6 can get pretty crowded lol. The kitchen was completely stocked which which made cooking meals a breeze. Our view from the second floor was perfect from our balcony. The distance from the condo to the beach was very short we were at the beach every day due to this. It's a very short drive to Myrtle Beach board walk, 2 huge outlet malls and attractions,walking distance to restaurants. We had a blast and it was perfect we would definitely stay here again. First time my family and I went to Myrtle Beach. Everyone really liked it. The place we stayed was nice and quiet. It was about a 10 minute drive to the attractions in Myrtle Beach, which is what we wanted. Condo was right on the water with a nice view from the deck/balcony. Condo was clean and the complex was quiet. 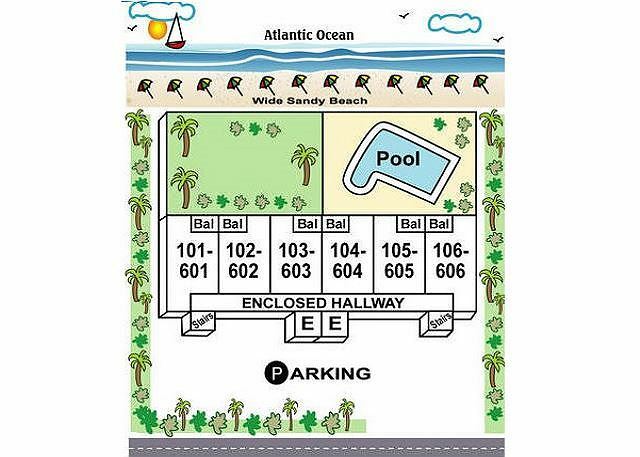 Great beachfront location north of all the congestion. Super clean, modern and large space for family. You can walk to several restaurants. The condo itself is one of the best we have ever stayed in and we had 7 and never felt cramped. Will be back next year. Very nice condo. Roomy and comfortable. We had a wonderful time at the condo and would highly recommend this to anyone who needs a quiet and relaxing getaway. It was our 50th wedding anniversary and our two sons joined us with wife and two grandsons. Very nice for us all. We used this location for a business retreat! All of us loved it! Great space, great views and wonderful management! It doesn’t get any better than this!!! We have stayed in this unit several times, and it just keeps getting better. Friends joined us, and we prepared gourmet meals thanks to a well equipped kitchen and redesigned pantry. The new washer and dryer made laundry a breeze so that we returned home with luggage full of clean clothes. 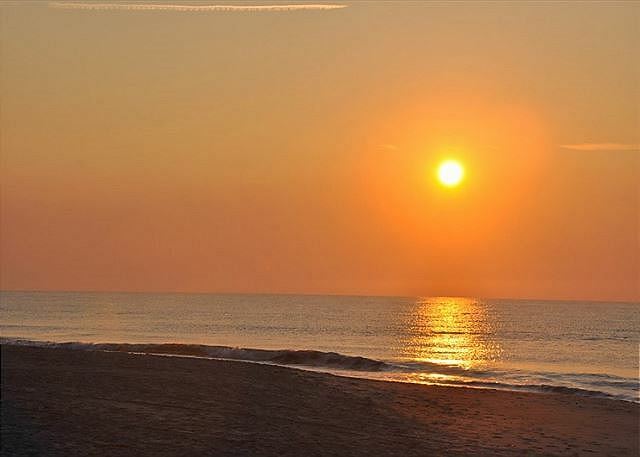 Super location right on the beach, nice and clean, very comfortable and stunning sunrises. No doubt we will return! We had a wonderful time at this condo. It was spacious and had all the items we needed while there. Decor was nice and beds were comfortable. GREAT LOCATION!!! We had a great stay here! The location is perfect and the beach wasn't overcrowded. The pool was large and very relaxing with plenty of chairs. Employees were out every morning cleaning up the grounds, which were beautiful. The condo itself has everything you will need! Plenty of knives, dishes, storage containers, etc. and the owners even had loads of books and movies, extra light bulbs and a plus was the first aid kit, which we had to get a bandaid from while we were there. The balcony has two bar tables and four chairs which made it pleasant for the four of us adults to sit together and watch the ocean. I could nitpick over certain things, but I won't because the good outweighed the not so good. Bottom line is, we were comfortable the entire week and we cooked some fabulous meals in the well equipped kitchen. 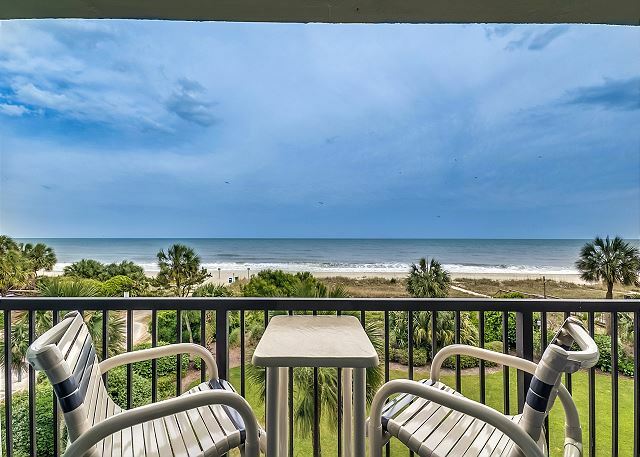 We will definitely keep this condo in mind when we plan our next trip to the beach! The only thing we didn't like was the bedding (all beds). The foam on the beds moved all night. Could be a hazard making it easy to fall out of bed. Sheets wouldn't stay on!!!!! This unit is better than what the pictures show! It is updated and very spacious. The kitchen was well stocked with pots, pans, etc. and there's a full size washer and dryer in kitchen. This condo is in a great location in Myrtle Beach which is not congested yet close to everything. It is minutes from Broadway at the Beach and Barefoot Landing. We would stay in this unit again. 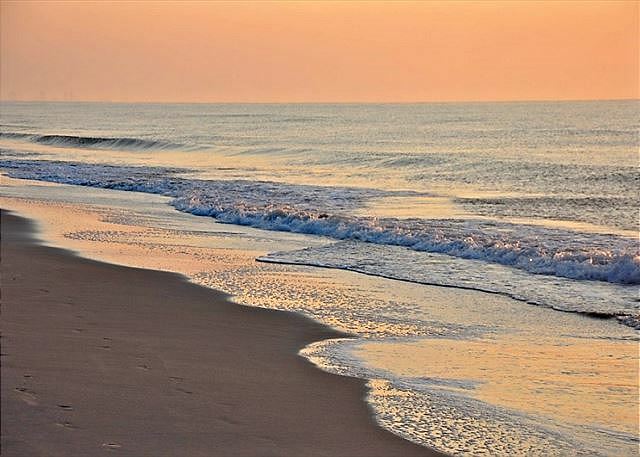 Carolina Dunes, #201 - perfect! We were very happy with this condo; very clean, decorated nicely, centrally located, beautiful view of the ocean and beach, meticulous pool area. All the conveniences of home with an ocean view and nice pool. It doesn't get better. No problems whatsoever. On the "Golden Mile", the beach itself was great - clean and well groomed daily, awesome to behold under a full moon lighting the beach! This was a beautiful unit with everything one could need for a great stay at Myrtle Beach! I do not know where to begin. There were seven adults and two small children in our party. The unit was so spacious. We all had plenty of space and privacy when needed. The unit was located in a quiet area and was close to all attractions. We enjoyed walking up and down the sidewalks looking at all the beautiful homes and landscape. The unit was equipped with everything down to the smallest detail. I would however recommend a small first aid kit be available. We were all satisfied plan on requesting this unit again on our next visit to Myrtle Beach. Our family really enjoyed staying at the Carolina Dunes. Unit 201 is very comfortable and clean. Hope to come back again! It was s great vacation time . The accommodations were the best surely will consider staying at this vacation rental . Great vacation spot for our group of girls! I booked this spot for a bachelorette weekend. Our condo was updated and clean! The bride was happy, so I am happy. Will definitely stay with y'all again in the future! Thanks! The condo was very clean and I am VERY picky about cleanliness. All furnishings were modern and all the linens were clean. The rental agent was very attentive and our stay was wonderful despite several days of rain. The only issue was that the Carolina Dunes stairwell did not smell very good because it is adjacent to the trash area. The Caravelle staff did make an attempt to clean the area, but there's not much you can do when the trash is so close. The 2 elevators worked great so we just used those most of the time. I highly recommend this particular unit!! I would stay here again with no hesitation. Second year we rented for a month. Can't wait to return. Have stayed in MB each year for over 20 yrs. this condo has it all. You won't be disappointed. We stayed at this condo last year. We enjoyed it so much we had to come back again this year. The upgraded tile flooring was a nice surprise. The kitchen and furnishings are very nice - we forgot how comfy the beds were. The location is just perfect for us. Already looking forward to next year! We had a great time. The condo was very spacious and clean. All beds were very comfortable, and had clean sheets, blankets, and comforters available. Kitchen was fully stocked with dishes, pots, pans, utensils, and glasses. Loved the fridge with icemaker. I would definitely stay here again! This place was perfect for the family. Our flight got to MYR a few hours earlier than the checking time and the staff was able to accommodate us. Great location. Great customer service. We will definitely stay here again. The condo was right on the beach. Great sea breeze on the large balcony. The unit was very clean and very roomy. The kitchen was equipped with everything you need if you plan to cook! The ONLY issue we had with this lovely condo was the loud music being played at the resort across the street. We know this issue is beyond the control of the condo management and the noise did not deter us from having a wonderful stay in Myrtle Beach. This was a girls beach trip after a long school year! We were more than pleased with this condo. It is, by far, the prettiest, cleanest, best decorated, best equipped condo I have ever stayed in - and I have stayed in a lot! It is definitely one that I will plan on coming back to - just for a longer time-frame next time! Our stay at Carolina Dunes could not have been better! Mom wanted a condo on the beach with an ocean view and that's what we got! Uncrowded beach, lovely pool, great balcony looking out to the ocean, very easy dealing with the management people. The only things wrong were a blender and lamp that didn't work, and 2 kitchen cabinet doors that needed tightening. The condo itself could not have been better. It was very large, very comfortable, very clean, and well equipped for guests. The location was perfect for us, being far enough away from the activities in downtown Myrtle Beach. My sisters, Mom and I had an unforgettable week! We stayed two weeks and loved every minute of our vacation! This unit is so well decorated and the ocean views are amazing! We loved having our morning coffee and watching the waves roll in! We cant wait to come back!